There are certain principles that the cost auditor has to observe in planning and performing the cost audit. There are also principles that the cost auditor has to see are being observed by the company he is auditing. 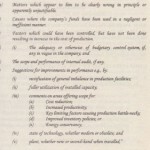 On the one hand, the cost auditor has to safeguard his independence and professional status in planning and performing the cost’ audit, ensuring quality and standard of cost audit, as required by his professional body, the ICMAP, as required by the Companies Ordinance 1984 and the Companies (Audit of Cost Accounts) Rules 1998, and other rules regulating his audit engagement and reporting; and on the other hand he has also to see that the client unit operates within the legal framework provided for the industry, maintaining cost accounting records, in accordance with the cost accounting records order rules applicable to the industry. The independence of the cost auditor is largely covered by the Companies (Audit of Cost Accounts) Rules 1998, under which a person who has or had specified relationships, which go to mar his independence, cannot be appointed as a cost auditor. Integrity implies not only honesty but fair dealings and truthfulness. The principles of objectivity imposes the obligation on all professional accountants to be fair, intellectually honest and free of conflict of interest. Financial involvement with the client effects independence and may lead a reasonable observer to conclude that it has been unpaired. A professional cost and management accountant should be straightforward and honest in rendering professional services as a cost auditor. He has neither any ulterior motives nor any personal ends to serve. He should be fair and should not allow any prejudice or bias, conflict of interest or any other influence to override objectivity. Cost audit is to meet the management and the Governments need for credibility in cost information and cost accounting systems. A professional accountant should not project himself as having expertise or experience which he does not possess. Attainment of professional competence requires a high standard of general education followed by specific education, training and examination, in professionally relevant subjects and a” period of work experience, with which all ICMAP members are equipped. Professional competence requires to be maintained by a continuing awareness of developments in the accountancy profession, including relevant national and international pronouncements on accounting, auditing and other relevant regulations and statutory requirements. The cost and management accountant has to maintain professional knowledge and skill at a level required to ensure that a client or employer receives the advantage of competent professional service, based on up-to-date developments in practice, legislation and techniques. 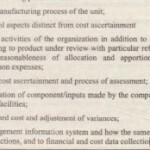 A cost and management accountant should respect the confidentiality of information acquired during the course of performing professional services and should not use or disclose any such information without proper and specific authority or unless there is a legal or professional right or duty to disclose. The duty of confidentiality continues even after the end of the relationship between, the cost auditor and the client or the cost and management accountant and the employer. A professional Cost and Management Accountant, being a member of the Institute of Cost and Management Accountants of Pakistan, should act in a manner consistent with the good reputation of the profession. He should meticulously avoid any such conduct or behaviour as may cast an unfavourable aspersion on the profession. He has to ensure professional behaviour while meeting his responsibilities to clients, third parties, other members of the cost and management accounting profession, staff, employers and the general public. A Professional cost and management accountant should carry out professional services in accordance with the relevant technical and professional standards. A cost and management accountant has a duty to render professional services with care and skill, in accordance with the instructions of the clients or employers, in so far as they are compatible with the requirements of integrity, objectivity, and in the case of cost and management accountants’ in public practice, independence. Moreover they have to confirm with the technical and professional standards laid down by, the Institute of Cost and Management Accountants of Pakistan, IFAC, IASC and the relevant laws, orders, rules and regulations. A distinguishing mark of a profession is its acceptance of responsibilities to the society. The Cost Auditors independence is to be judged by its clients. Government, employers, employees, investors in the business, the financial community and the consumers at large, who all rely on the objectivity and integrity of the cost and management accountant. This reliance imposes a public interest responsibility on the professional cost and management accountant. A professional accountant in public practice should not con-currently be engaged in any business occupation and activity which might impair his integrity, objectivity or independence or the good reputation of the profession. The code of professional ethics the Institute of Cost and Management Accountants of Pakistan, must be carefully observed.